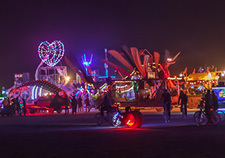 For years now, people have been visiting LED Montreal to prepare for their trip to Burning Man, getting all they need here at the #1 source in Canada for battery powered LED lights and EL wire. For those who like to see in person, our store is open to the public and it contains a nice showroom, which allows everyone to see and test out our products before buying. Good preparation is best! Burning Man is an annual festive event held in the Black Rock Desert, in northern Nevada, USA. Starting in late August, it runs for a week ending with the burning of a huge wooden man. The whole time, participants are encouraged to take part in a communal experiment of art, self-expression and self-reliance. Since a lot of big events are held at night, and far away from city lights, battery powered LED Lighting and EL Wire are the ideal solutions to get seen and go around with no fear at night. 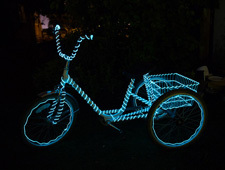 LED lights and EL Wire are bright and energy efficient, and allow you to be visible and creative at the same time! 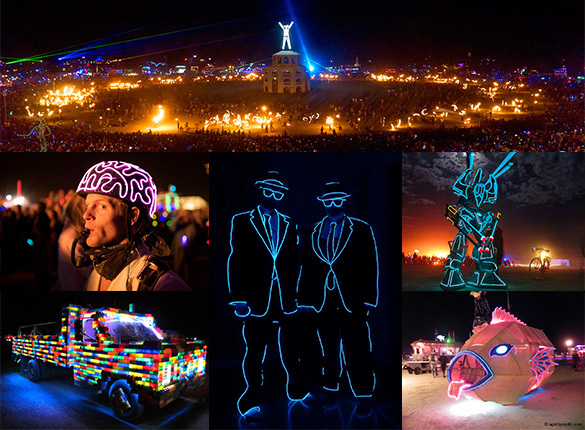 Battery powered LED lights and EL Wire are the coolest decorations to use for anything at Burning Man! EL wire is very flexible and features a very nice glow, which makes it ideal to help create your own costume and get noticed at night. LED lights are very bright and easy to handle, and are a perfect tool to illuminate your bicycle, mutant vehicle, tent or art project. With the right lights to work with, all you need is imagination to make your stay a magical one! Since there is no light on site, battery powered LED lights and EL Wire are great security features. Illuminate yourself and/or your bicycle in order to be seen at night and avoid unfortunate accidents. LED Montreal also carries a variety of LED Lights for Bicycle (bicycle wheel pattern producers, tail lights, wheel caps, flashlights, etc. ), good products you can easily add to your bike to make it more visible. Preparing your trip to Burning Man? LED Montreal is the right place to visit to make your whole experience a memorable one!